I’ve been making plans for future flower arranging workshops, and giving thought to the process behind creating glorious flower arrangements. Like a magpie I’m being attracted to lots of sparkle and colour, curating tints and tones that I’m being drawn to at the moment. Time’s marching on and before I know it another week has passed and my to do list is still largely undone. With the help of my business coach Lucy Stanyer, I’m getting to grips with the process of planning. It’s my word for 2015 “to plan”. Away from the flowers in my life, I’m becoming quite a whizz with a spreadsheet – although at the moment I’m using it much the same as pieces of squared paper in school. I’m colouring boxes and trying to get my work-life balance to tessellate. With time I’ll be adding text, deadlines and periods for review. I need to persevere. To feel the pain and come out on the other side. Reap the benefits of moving forwards. All this talk of moving forwards makes me a little bit sad for the changing seasons. Spring is nearly over. Summer is waiting to be embraced. Although, being fair skinned I prefer enjoying the sunshine from the comfort of a huge sunhat and some shade! I’m a little bereft at the thought of losing the spring flowers, although on the whole it’s only the daffodils that have gone from the garden to make room for the tulips. In any event, when I nipped out to the shops yesterday I noticed bunches of daffodils for sale, so we can’t really be ready for summer yet. The spring blues have a special place in my heart. I love the naivety of forget-me-nots. 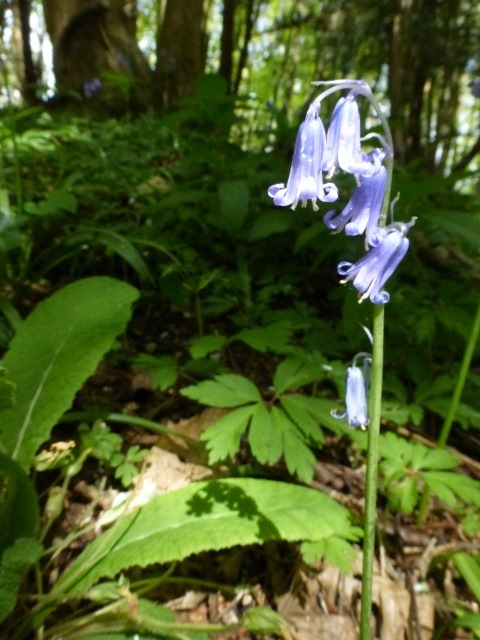 They grow quite robustly in our garden and last well as a cut flower and of course there’s the fabulous bluebell. 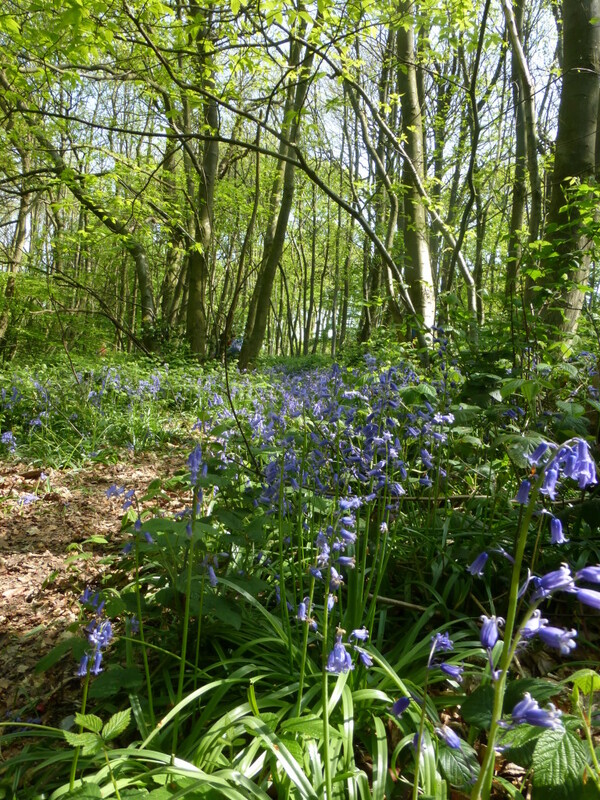 We went on our annual Bank Holiday excursion to the bluebell woods – I blogged about our visit last year. This year we didn’t get lost and walked the short route with the newest member of our family. 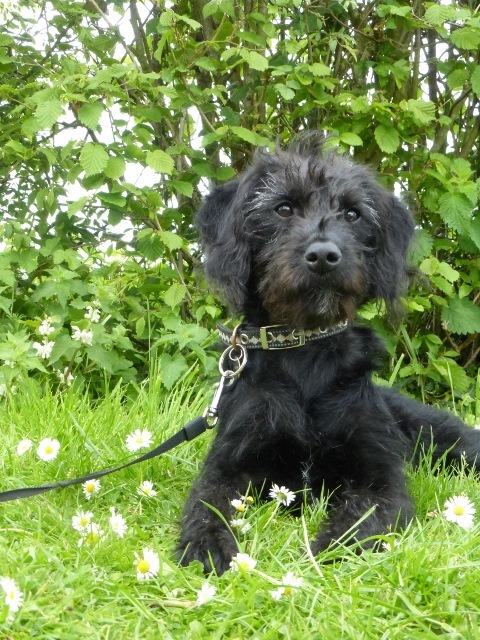 Maggie is a cute little black dog. The inner artist in me almost leaps into action at the site of the haze of bluebells. Much like my aptitude for spreadsheets, my thoughts don’t actually translate to canvas. Perhaps I should start small, with some pastels in a notebook, and work up from there. See I’ve written that down – its a commitment, an action to check up on. Today I bought myself a bunch a white hyacinths – they may be the last of the season. The retail season for spring flowers is really quite long stretching from pre-Christmas to the end of May. 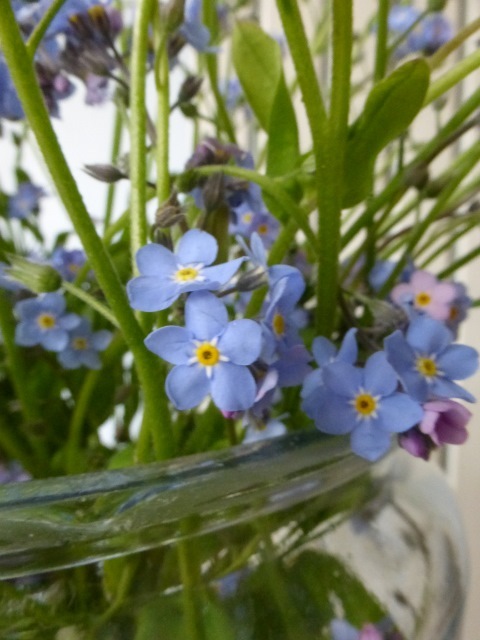 If you drop me a line at julie@juliedaviesflowerworkshops.co.uk I’ll forward you a copy of my hints and tips for cut spring flowers in your home. I’d love to hear what your favourite spring flowers are and how you like displaying them. I love your tessellation analogy Julie, I can just see you with those bits of paper. And gorgeous pics of the bluebells. I’m gutted that we’ve not managed to get up to the woods yet. Just this weekend to try and make it happen before they go again. Thanks for taking the time to comment Lucy – sometimes you’ve just got to work out a few patterns in life eh? I hope you get out to see the bluebells before they disappear!